There were no additives in the food eaten in the island at the turn of the century. Many families had a pig or two, and there was fresh pork to roast, fry or boil, and bones to make into porky soup, with the dark green cabbage grown in circular, walled gardens near the shore, and fertilised with seaweed every winter. Some of the pork was salted down in sweet pickle made from brown sugar and saltpetre. There was enough to cure for bacon, which hung from the rafters. As the pigs were killed at different times, providing there was a waxing moon and a flowing tide, and since pork was used to pay debts, and given as a compliment, neighbours also got a share. 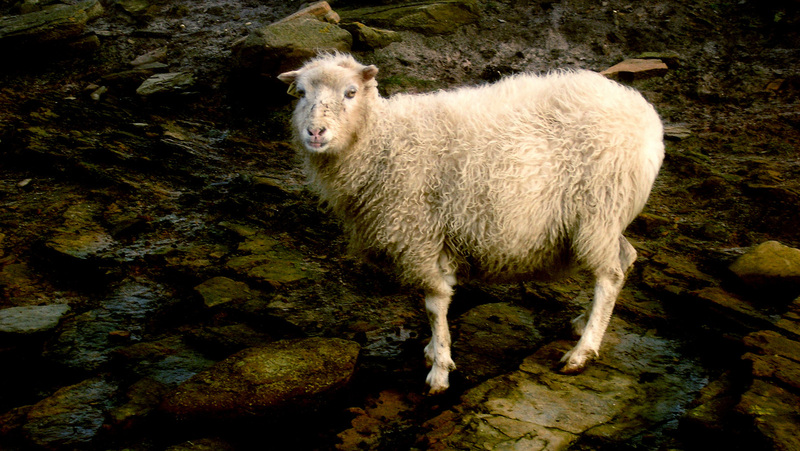 Every household had its quota of native sheep on the shore, where they lived on the mineral-rich seaweed thrown up by every tide. There was lamb and mutton, both fresh and salted, and sometimes smoked. A shoulder, or the ribs, were boiled in a big iron pot over the fire, with peas and barley, and fresh carrots and onions from the garden. Potatoes were also boiled in the pot, then the meat lifted out on to an ashet, and the soup eaten first, followed by the mutton and potatoes. Mutton was a winter food, for the sheep were at their fattest in the storms of winter, which threw tons of seaweed on to the shore. Herring, cod and haddock, as well as saithe and ling, were caught in summer and fried in dripping, rolled in oatmeal, or boiled and eaten with melted butter and new potatoes. The surplus was dried in the sun on the stone roofs, or on lines stretched between stone walls, as in Norway. The dried fish was boiled in winter, and eaten with ‘dippings’ of melted butter. Salt herring was bought in small barrels of brine. In Shetland the livers of fresh fish were chopped with onion, mixed with oatmeal, and stuffed into fish heads tied with thread, before being boiled. Crabs, or partans, were also eaten. Cows were treated well, since for one to die would have been a great financial loss. They were given extra treats, oatmeal drinks and brochan after calving, and ale, which they loved. The water they drank was lukewarm, to prevent a chill, and the milking cows were always taken in at night. The first milk after calving, the bees’ milk, was made into a creamy cheese, which was considered a delicacy. Butter was made in the wooden plout-kirn, golden-yellow from the clover fields, to eat fresh in summer, and salted down for winter. Where possible, they tried to keep a little butter for the cold days of March, when people were weary after a long winter. Buttermilk was used as a drink, and for baking bannocks and scones, and also allowed to ferment into bland, a fizzy drink useful in harvest-time. Any leftovers were given to the pigs. Oatmeal, stored in the big wooden girnels, a year’s supply at a time, was used for porridge, gruel, oatcakes, and brose, made quickly by pouring boiling water and a little salt on to oatmeal in a bowl, and stirring it. Mealy puddings were also made from the oatmeal, mixed with melted sheep’s fat, onions, and salt, then boiled in pudding skins. If the mealy puddings were to be stored in the girnel with the meal, the onions were omitted. They could be eaten cold, in slices, or heated in the frying pan. Bere meal too was used for bannocks, and as it was home-grown and milled on the island it was economical as well as nourishing. Bere bannocks were broken into small pieces and warm milk poured over, for a small child’s supper. The grop, or waste, was fed to pigs and hens. Ale was brewed from malt for harvest, weddings, yule; and when a new house or shed had to be built, there was a brewing, and neighbours worked together to put it up for no payment. With no means of cooking or baking other than a small stove, it was wonderful that the women managed so skilfully to feed their large and hungry families, and to try to help those who had an even harder struggle to live off the land. Their diet was sound in many ways, produced almost entirely at home, and free from hormones, colourants, and preservatives. It may have been monotonous, and not to modern taste, but it must have had its advantages, for there are many people here who are in their eighties and nineties, and still fit and healthy.